...Asking price: 26,000 PKR. Bedrooms: 3. Bathrooms: 3. 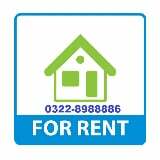 More Information and Features: Samanabad, Rent House, House for Rent in Samanabad Lahore. ...Tv Lounge. Three Balcony. Rent 15000/. 900 Sq/ft Contact No. 92300-4521--- +92333-4266--- House no. 16-A-1 Street No. 18-N Gulberg II Lahore.